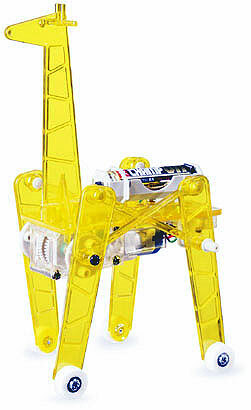 Motor rotation is transferred to the legs via crank plates and linkage rods, causing the Mechanical Giraffe to walk. The body is made from a transparent yellow ABS resin that allows you to see all of the motors, gears, cranks, and linkage rods in action. Requires one AA (a.k.a. R6 or UM3) battery (not included).